You wouldn’t recognise our house at the moment. We’ve got the builders in. They’ve come to take the roof off. If all goes well, they will then put a nice new one on. The front of the house is covered in scaffolding and every time it rains large tarpaulins are unrolled and tied down, then, the minute the sun comes out, the roofers rush back up the ladder and crawl all over the roof unlashing and rolling back the covers. They are hoping that the wood worm and assorted nasties will get fed up with the noise and disruption and pack up and leave to seek more tranquil lodgings. Now, I’m sure you are all aware that one swallow doesn’t make a summer. In the olden days, when people had nothing better to do than sit around making up phrases that could be posted on Facebook – as soon as someone invented Photoshop – the devil was safely at home, down in the nether regions, and not in the detail. As some bird flips fleetingly past with the characteristic strut of the swallow, today we have (at least) four choices. Is it a swallow, a house martin, a sand martin or a swift? Just round past the beck is another farm. In its yard is a large puddle with an amply muddy surround. A building site and a convenient source of materials proved to be difficult to resist. We managed to photograph the construction crew picking up supplies at the puddle so we can confirm that these self-build enthusiasts – not easily identifiable here – are a pair of house martins. I hope the roof replacement goes smoothly, David! (Well, as smoothly as a roof replacement can.) And are swallows, swifts, and martins all part of the same family? 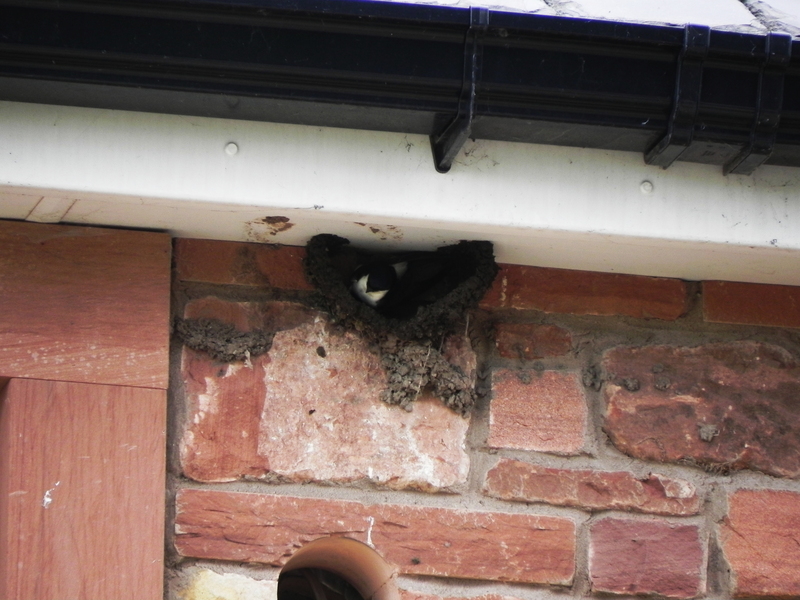 I know swifts construct those nifty types of nests, and it looks like martins do as well. I wonder if swallows do. That’s a very good question. I think a really good answer would probably be – maybe. I think . . . swallows and house martins build under the eves of buildings – swifts nest in a hole in a cliff or in a building as do sand martins. But please don’t quote me on that. The building work is rumbling on – so far the ceiling has only fallen down in one place – another couple of weeks to go yet though. its happy hour again, wow , that is some capture, a bird building its nest! As you can imagine – The Dog got very grumpy, sitting waiting while I waited for the damn bird to sit still for a second! I’ve heard they are a beautiful bird with purplish feathers, but I’ve never seen one in person.